DNS Accountants is a group of experienced professionals who excel in the fields of accounting, tax planning, and consulting services with an aim of raising your business to a new level. It is quite cumbersome to handle all the accounts of your business and at the same time develop its potential to succeed in the upcoming years. So for your ensured success in the long run, we provide you with an excellent team of expert accountants who will diligently handle all your tax planning and keep you updated with all the new tax policies that come up. We have high powered customized software for keeping track of your accounting as well as your tax formalities. All these premium services are offered at a very competitive price enabling you to keep track of all your accounts through an easy online process. DNS has proven its commitment to excellence by achieving many awards throughout the years and has won the 2016 Best Accountancy Leading Firm award as well. We have given accounting solutions to more than 1200 clients from various business backgrounds through our expert professionals, who specialize in accounting, tax management, consulting services and hold degrees from reputed universities. So you can trust us without hesitating, we guarantee you will be fully satisfied with our services, as we provide you with the best Contractor Accountants in the UK. Canary Wharf is one of the main financial centers of the United Kingdom, located in the East London. It is one of the major business districts with many of the Europe’s tallest buildings One Canada Square stands out amongst the crowd. It houses numerous major organisations including Barclays, Morgan Stanley Citigroup, Clifford Chance, RBC, J.P. Morgan, Fitch Ratings Credit Suisse, Infosys, HSBC, KPMG, MetLife, Moody's, Skadden, State Street and Thomson Reuters to name a few. These major companies employ thousands of residents as well as migrants from outside as well. Being one of the busiest areas in the UK, many people have come up with their creative businesses in this area, and we have helped them make it successful with our expert accounting and tax consultancy services. What all do we help with our Accountancy Services? Our Tax Accountants in Canary Wharf specialize in tax planning, tax investments, tax advice and business consultancy services. They will keep a track of all your accounts on day to day basis and ensure that there are no errors in them because even the slightest mistake can have huge ramifications. We help you to stay updated with all new tax policies and discuss them with you. We always let you take the decision before taking any further action on any matter. Our tax accountants will mainly look after your complete data tax collection, Complete all your required tax reporting in time and update all your tax provisions and prepare your tax returns as well. Our fully customized user-friendly software, which gives you 24x7 access to your accounts, will assist you in controlling and monitoring your accounts. Our software gives you facilities to access all our services such as company formation and registration, assistance in opening a new business bank account, bookkeeping facilities that maintain a track all your business accounts and also provide you with continued online support with round the clock. while providing you with Financial Data Management, our Professional IT contractors Accountants in Canary Wharf will maintain all your financial records and ensure complete compliance with statutory guidelines. We always follow established procedures and policies laid down by the authorities. They also deal with various important company matters like internal accounting and Government Accounting. 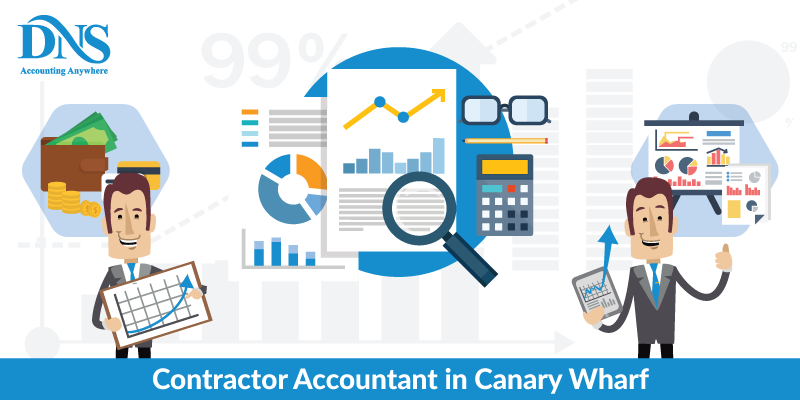 Our IT contractor Accountants at Canary Wharf will guide you through all the major procedures of accounting. Whether be it big or small firm, we help in the management of all types of businesses. DNS Accountants provides you well packaged user-friendly software which helps in managing the accounts and all the tax planning of your day to day business at very affordable rates so that you do not have to worry anymore about the accounts and tax planning. Helping you with all the Tax Accounts, Management Accounts, Financial Accounts, and Budget Analysis and our Chartered Accountants specialize in all these areas. Along with giving you consultation over all the problem areas where you lack behind, we take care of promoting your business goals as well. Our aim is to help you take your business to new heights and let you compete against other major market forces. VAT Registration and Returns Services: DNS has a team of seasoned Tax and VAT Accountants that will help you in VAT registrations with HMRC and keep you informed about the complications of VAT registration. They will not only help you with VAT registration for your business but will also help you select the category under which you should register. Completing the VAT registration formalities is a tiresome process, but with expert guidance from our consultants, you can just sit back and relax. We will handle all the paperwork required for a VAT registration. Our team will also help you in preparation and filing of your quarterly VAT returns. Bank Account opening: A bank account is crucial for any business, but the process of opening a bank account is tiresome and sometimes a little complex also. However, you need not worry anymore; our team will take care of all the formalities including documentation required for opening a bank account and will help you throughout the procedure until you get your account number. We provide you with experienced and professional contractor accountants in Canary Wharf, making it easy for you to properly handle your business with error free accounting and accurate tax consultancy. We have extended our services to many other places all over the UK. As being a trusted association and an award winning accountancy firm we believe in satisfying all our clients and partner them in the growth of their business. Be a partner with us and we will help you with all the accountancy and taxation services, you need to run your business efficiently.